Home / / Epoxy Paint – As Tough As It Gets! Epoxy Paint – As Tough As It Gets! 2 part epoxy paint applied to garage floor. If you are thinking about epoxy paint, then you have a need for one of the toughest coatings possible. Epoxy paints are two component coatings and sealers that have incredible resistance to many chemicals. Plus, generally, they are very hard when fully cured. The two separate components are mixed together, and provide a barrier forming coating. An epoxy coating is resistant to water, including salt water, most cleaners, mild acids, solvents and shop chemicals, including gasoline. Plus, has very high abrasion and impact resistance. Available in many colors, custom mixed colors possible with many brands, and clear to protect previously painted surfaces. Sheens are typically semi-gloss or gloss. This is an interior use only product, typically applied to ceilings, walls and concrete floors. Used primarily in commercial and industrial applications. This ultra hard, protective finish can be used in residential applications as well. Some uses are bathrooms, bathtubs, sauna rooms, poolrooms, appliances, shops and garage floors. Two types are currently on the market, solvent-based and water borne. Solvent-based epoxy paint is becoming difficult to find. And rightly so. Generally smells bad, difficult to use and can “lift” previously painted oil based coatings, causing problems. Considered the toughest type of epoxy, it is also the most difficult to apply. Typically used in industrial situations. The major drawback to all epoxy paints is – interior use only. These finishes will oxidize quickly when exposed to UV light. This doesn’t diminish the overall strength of the coating. This is a two-component system, once mixed it must be used in a specified amount of time. All remaining paint will harden and be unusable in just a few hours. 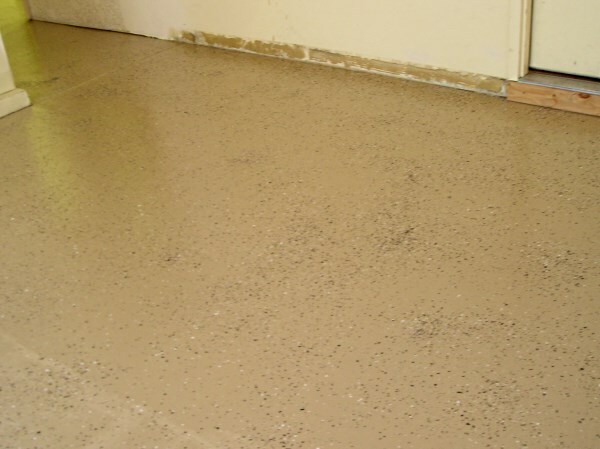 A water borne epoxy coating is superior to solvent-based epoxies in many ways. Very little odor. Low or no VOC varieties are on the market. Can be applied in occupied buildings, this includes your home. Ventilation is still important, especially for curing. Easy to use. This depends on brand, but generally applied the same as regular paint. Use a synthetic brush, roller or airless sprayer. Can be a little sticky, causing you to work harder. This is especially true for ceilings. Easy clean up. Soap and warm water cleans your tools and any small spills. Brush cleaner might be necessary if allowed to partially dry in the brushes heel. Incredible adhesion properties. Can be applied to a wide variety of materials, ranging from plywood to concrete block. Has all the valuable properties of solvent based epoxy paint without the problems. This includes abrasion, and impact, resistance plus the ability to resist harsh environments. High amounts of solids. This provides you with a coating that will go on thick without sagging and cover or seal the surface in less time. Formulated for both wall and floor applications. Giving you the look you desire. Is there an outdoor epoxy house paint available? No, not a true epoxy paint. But there are both catalyzed and non-catalyzed urethane paints that are very tough and rated for exterior use.